Naked Winery says they are “on a mission to cut America’s divorce rate in half by inviting couples to shut off the electronics and share a glass of wine with each other nightly.” It’s easy to get behind that mission, especially when the wines on offer are made from the best grapes Oregon and Washington has to offer. 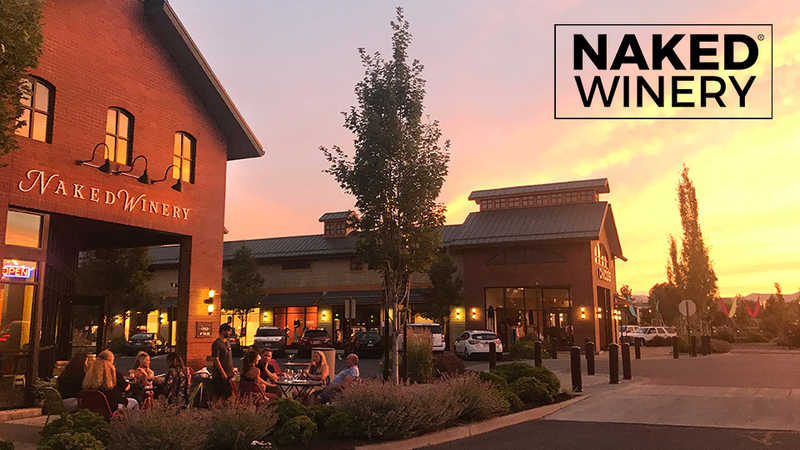 Naked Winery is based in Hood River, Oregon but you can get the Naked experience at their Bend tasting room in the Old Mill District. With a view of the Cascade mountain range from their outdoor patio, this is an excellent spot for day drinking, an early start to the weekend, or just about any other occasion you can think of. The tasting room is also the perfect destination for bachelor/bachelorette parties, reunions, girls’ night out, or date night pre-funk. Naked Winery is open seven days a week with a different special running each day, including Monday Madness (four bottles for $99), Wino Wednesday (buy one, get one 50% off), and Mimosa Sunday ($5 mimosas all day). Whether you get Naked by the glass or the bottle, or join Club Naked, Naked Winery is focused on the fruit and on making sure you enjoy every sip. Hours: Monday -Saturday 11:00 a.m. – 8:00 p.m. Sunday 11:00 a.m. – 6:00 p.m.